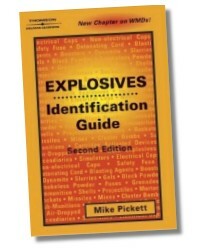 Explosives Identification Guide, Second Edition, is an excellent quick reference for emergency responders - providing the necessary information to effectively identify explosives by type, and how each should be treated. 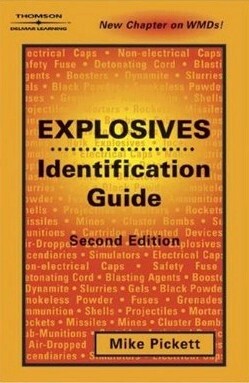 Written with a straight-forward, non-technical approach, this book covers both commercial type and military ordnance explosives, and explains bomb search procedures in a manner that is easy to understand. Keeping up to date, this edition also includes an all-new chapter on weapons of mass destruction, and features new photos depicting modern-day explosives. 59 Pages - 6 x 9 in. 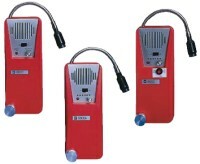 Mike Pickett has over 37 years experience as a firefighter including ten years as an EMT. He was the Director of the San Antonio Regional Fire Academy and Fire Science Program for 25 years. He is currently an Associate Professor Emeritus and teaches explosive identification and counter-terrorism to audiences across the country.